The year 2012 marked the 150th anniversary of the founding of the Plymouth School of Navigation, which provided vocational education to merchant seamen of the Victorian era. Thanks to the Marine Navigation Centre, that legacy of training and development is delivered to a new generation of professional seafarers through modern, state-of-the-art facilities. With its combination of dedicated systems and flexible teaching space, the Marine Navigation Centre aims to meet the needs of the maritime world - from learning how to navigate super tanks or superyachts, to providing professional development courses tailored to specific organisations. The University already delivers contracts to international shipping companies and marine support organisations, which when couple with its water-borne assets and proximity to the sea, provide a first-class combination for education. 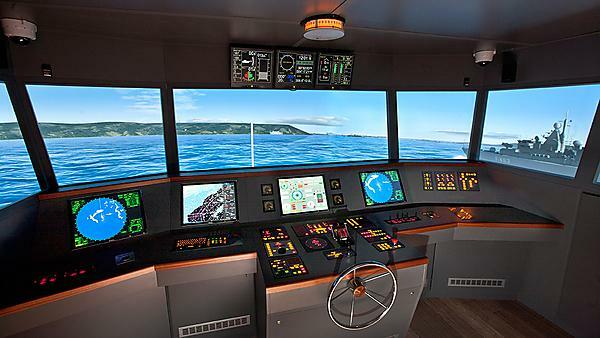 At the heart of the Marine Navigation Centre sits the Ship Simulator powered by the world-leading Tranas NTPRO software, and able to recreate the environment of a real vessel navigating the oceans. This state-of-the-art facility uses advanced computer imagine, projection, and a 270-degree screen to conjure a highly-detailed visual canvas upon which mariners can learn to perfect their skills, using exactly the same systems they would at sea. Global coverage with Admiralty Vector Charts. The ECDIS Lab provides the capacity for training professional seafarers in the correct use of modern electronic chart systems which are becoming mandatory for use on all commercial vessels. The adjoining Chart Room is a flexible teaching space which can also be used for practising 'traditional' navigation using paper charts. The CAD Modelling facility is where new visual scenes are created for use in the Transas system. This makes it possible to trial the safe navigation of various types of vessel into new port developments and - of increasing importance to shipping companies - around the deployment of next generation marine renewable devices, such as wave energy machines.